Potassium is a mineral that is essential for the beating of the heart, as well as other important functions within the body. But when our bodies have low levels of potassium, which can occur due to certain medications, disease, a condition called hypokalemia--chronically low levels of blood potassium--and long illnesses where there is a lot vomiting and/or diarrhea. Potassium chloride is a supplement to help make up for low levels of potassium and can have both positive and negative effects on the heart and the body as a whole. One risk of taking potassium chloride is that instead of simply restoring your potassium levels to a healthy balance in your body, you get too much potassium into your system. It's called hyperkalemia, and though it's certainly treatable, it can be life-threatening. It can lead to heart rhythm irregularities, paralysis and significant muscle weakness. If you start to experience any of those symptoms after you take potassium chloride, be sure to see a doctor immediately and try to bring along the bottle of potassium chloride tables so your healthcare providers will know how much you've had. Potassium chloride supplements are especially helpful if you are on a diuretic, or "water pill," to treat high blood pressure. One of the possible side effects of a diuretic is potassium loss, and potassium chloride can restore your potassium levels to a healthy range. A normal, consistent amount of potassium in the bloodstream can not only help your heart beat consistently, but it can maintain heart strength and help prevent heart failure, the inability of the heart to beat sufficiently to pump blood throughout the body. A study published in 2005 in the journal "Hypertension" showed that potassium chloride can help lower blood pressure, which puts less stress on the heart and lowers the risk of a cardiac event, such as a heart attack. 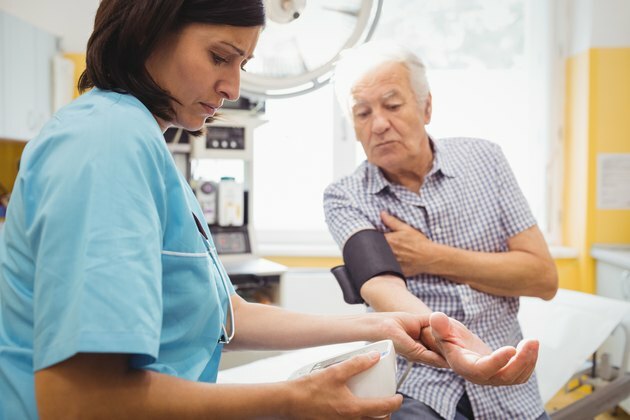 While potassium chloride supplementation may not be enough to lower blood pressure in all hypertensive patients, it may be a supplement you should discuss with your doctor, particularly if your blood work shows your potassium levels are low or borderline low.